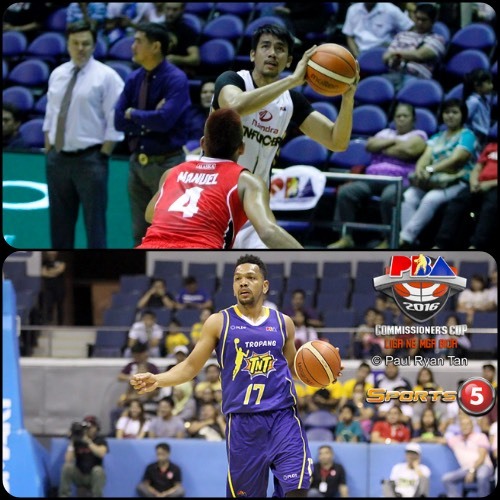 Jayson Castro triumphantly returned to action for TNT in the 2016 PBA Commissioner’s Cup even as Aldrech Ramos popped the cap as Mahindra upset Alaska. The Mahindra Enforcer got a huge second half lift from Aldrech Ramos as they defeated Alaska, 102-94, to snap a three-game losing skid in the 2016 Oppo PBA Commissioner’s Cup on Monday at the SMART-Araneta Coliseum. Ramos, who was scoreless over the first two quarters, erupted for 25 points in the second half – including 16 in the fourth quarter – to help lead his team to a victory, their fourth in eight games this conference. KG Canaleta scored 17 points, including four three-pointers, while import Augustus Gilchrist posted 16 points, 15 rebounds and seven assists. Karl Dehesa and LA Revilla also contributed, scoring 14 and 10 points, respectively. Alaska dropped to 5-3 after losing a second consecutive game. They won four straight prior to their defeat against San Miguel last Wednesday. Shane Edwards paced five Aces in double-digit scoring with 24 points, while Calvin Abeuva added 15 markers. Augustus Gilchrist (MAH) - 16pts, 15rebs, 7asts, 2stls, 2blks, 1 triple. Jayson Castro made his explosive return to lead Tropang TNT to a 114-103 beating of the Rain or Shine Elasto Painters in OPPO PBA Commissioner’s Cup action Monday at SMART-Araneta Coliseum. Castro, playing in his first game after reinjuring his Achilles tendon earlier this month, scored 26 points, four rebounds and four assists to pace TNT (4-4) to their second straight win. It was a lopsided affair in which TNT got off to an 18-6 start to the game. Import David Simon added 20 points and 14 boards for TNT. Playing without suspended coach Yeng Guiao following his technical fouls last timeout, Rain or Shine (4-4) snapped its three-game win streak. The Elasto Painters were led by JR Quinahan’s 25 markers, Mo Charlo’s 22, and Jericho Cruz’ 21. JR Quiñahan (ROS) - 25pts, 12rebs, 2stls, 4 triples.